On Sunday, January 19, 1997, Canadian radio lost one of its legendary figures. Norman Blakely, 53, the guiding force behind FM 108 and for more than a-quarter century one of the country's top disc jockeys, died of a heart attack at his home in St. Catharines, Ont. While many listened to Norm on the radio over the years, and a few were lucky enough to know him personally, his life story is not as well known. Here's a look at Norman's career. Norman B. was both a traditionalist and an innovator. A fan of old-time rock 'n roll and even older blues and jazz, Norm blazed many trails in Canadian radio during a career spanning much of the last third of the century. - In 1964, he started "The Jazz Scene", one of Canada's foremost jazz shows. - He was the first deejay in Ontario to have an all R&B show, "Where It's At" on CKFH in 1967. - He helped establish Canada's first oldies station on FM - FM 108 CING-FM) in the late '70s. Norman Blakely was born December 18, 1943 in Hamilton, Ont. By his early teenage years he was already hooked on rock 'n' roll and blues via legendary deejays like John R. in Nashville, the Hound in Buffalo and Alan Freed in New York. At age 15, he attended his first concert - one in Kitchener, Ont. The 1958 show featured both Sam Cooke and Jackie Wilson with Freed as the MC. Around that time, Norm started collecting rock 'n' roll and blues records and didn't stop until he had one of the most extensive collections on the continent. The seeds was planted for a career built around rock 'n' roll and the blues. The best way for Norm to share his music was to get on the radio and play the records he loved. That in mind, he took the highly-regarded Radio and Television Arts course at Ryerson Polytechnical Institute in Toronto. Norm attended Ryerson from 1963-65 and didn't have to look far for his first radio job - he landed on the air at Ryerson's own station, CJRT-FM. While there he started what has become a radio institution - "The Jazz Scene" - a late-evening blues and jazz show. He was succeeded on the show by Ted O'Reilly, who continued on the air there for another 37 years after Norman departed. Norm's first radio job outside of CJRT was at CFOS Owen Sound, Ont. in the summer of 1964 and again in the summer of 1965. But, Norm's music tastes and presentation proved to be - as he put it - "too wild" - for Owen Sound. After that, he worked at CJSP Weyburn, Sask., and CJME Regina before moving to CJWA in Wawa, Ont. Norm says his first "really good gig" was at CJIC Sault Ste. Marie, Ont. It was there, in August of 1966, that Norm started playing the music that he was best known for - R&B. While at CJIC, he mixed the current hits with R&B and by design or otherwise set the stage for his next move. In 1967, Norm was granted an opportunity he couldn't refuse - a chance to host an all-night R&B show on CKFH Toronto. He started there March 1, 1967 and created a show that has achieved almost mythical status over the years. On "Where It's At. ", Norm played much of the R&B that he felt had been forgotten by AM radio over the years, filling the airwaves with such non-mainstream artists as Howlin' Wolf, Erma Franklin, Kip Anderson and Howard Tate, with a bit of Aretha Franklin and Otis Redding thrown in for good measure. Then there were the interviews. Norm had many live in-studio chats with artists such as Fats Domino, Billy Stewart, Junior Walker and Jimmy Smith. The artists would come by in the early morning hours (he was on from 1-6 a.m.) after they were finished with their appearances at Toronto nightspots. One of these artists, King Curtis, gave Norm his famous nickname "Norman B". After an interview with Norm one night at CKFH, Curtis paused to listen to the show on his car radio and was amazed at the scope of the music being played and by the breadth of Norm's musical knowledge. Talking to Norm later, Curtis compared the deejay to WLAC legend John Ritchbourg, better known as John R. He suggested that Norm, like John R., use just his last initial on the air and become Norman B. Norm, who was awestruck by the compliment, started using the nickname on air from then on. "Where It's At" was cancelled on August 30, 1967, despite strong ratings. Said Norm: "The only people who liked us were our listeners". The reasons for the cancellation remain clouded, but in any case the show was gone and Toronto radio listeners were poorer for it. Norm's R&B revival did not die with the demise of "Where It's At". By 1968 he was back on the air at CKBB Barrie, Ont., with a Monday-to-Friday 7 p.m. to midnight show called "Spinout". The show featured mostly contemporary hits of the day, but from 10-11 p.m. on Thursday nights he presented "The Blues Revival". This show included interviews with such legends as Muddy Waters, Albert King and B.B. King. It lasted for two years. After leaving CKBB, Norman went to CHOW Welland, Ont., in 1970. 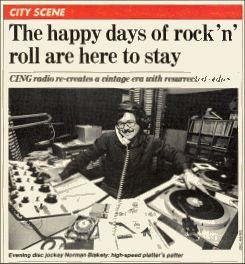 He continued to "do his own thing" on the air until the station went to a tight playlist in 1974. After a year of working with a playlist (which he hated), the station changed format to country in 1975 and Norm quit that very day. In fact, it was four years before he worked in radio again. Norm spent most of the late '70s concentrating on his other passion, gardening, and never going near a radio microphone. But for Norm, his best radio years were yet to come. 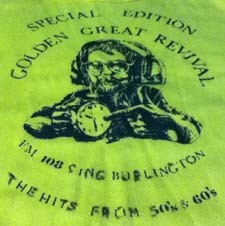 Norm's "retirement" from radio ended in 1979, when he was hired to do sales for CING-FM in Burlington, Ont. This station had gone on the air in 1976 with a beautiful music format, but in the fall of 1978 they started playing oldies in the evening and overnight period. It was called the "Golden Great Revival". By March 1979, Norm was on the air on Tuesday and Thursday nights, playing a mixture of Top 40 oldies and R&B. Not long after that, the station decided to add the "Golden Great Breakfast" to the lineup and Norman was asked if he wanted to do the show. He did. By this time, Norm's perspective had changed. No longer did he want to be the radio gypsy, bouncing from station to station. He wanted to settle down, and FM 108 seemed to be the ideal place to do it. Norm also understood the business end of radio by now. And while he loved playing r&b and rare rock 'n' roll, he also wanted to make a living in radio. If that meant playing some mainstream hits now and then, so be it. By 1981, Norm became program director and music director of FM 108. His newly-acquired business acumen combined with his radio experience and knowledge of rock 'n' roll made him the perfect choice to lead FM 108 into the '80s. The fact that he had literally thousands of hours of interview tape of rock 'n' roll's greatest stars didn't hurt either. Norm's archive of musical knowledge and interview tape were especially valuable inasmuch that CING was an FM station. Broadcast regulations at the time required that all FM radio stations play a certain amount of "foreground" or lengthy "theme" programming with a significant spoken-word element. There were also "mosiac" requirements, which involved shorter segments of feature programming. The result was a wide variety of feature programs, all courtesy of Norman. From 1979 to 1980, FM 108 carried "Norman B. and Friends" from 11 p.m. to midnight on Monday nights. There was also "In Touch With Yesterday", a 30-minute program, and "Personality Profiles", which was 15 minutes long. These programs appeared at various times in the FM 108 program schedule from 1980 to 1987. Norm also put together interesting shows called "The Wax Museum" and "Profiles", which dealt in themes and did not contain interviews. There was also a interview program in the mid-80s called "The Late Show", and he also assisted Fran Roberts on "The Elvis Hour." Norm gave up the regular morning show in the early '80s and was mostly heard on tape thereafter. However, now and then he filled in for other jocks and always provided unforgettable radio entertainment. Norm also had an eye for on air talent, hiring such notables as Wes Atkinson, Russ Horton and many, many others (check out the FM 108 Alumni Page). He also gave many a green rookie a break, a chance to go on the air and prove themselves. I was one of those people and I'll always be thankful. During his FM 108 years, Norm developed other interests, including short-wave DXing and scanning. In fact, he was considered one of the leading experts in the hobby of scanning in his later years. On a personal note, he married Sharon and moved to St. Catharines, Ont., where he commuted to work in Burlington. In 1991, FM 108 changed its format from an oldies-CHR mixture to full-time dance music as Energy 108. Norm, while no longer program director under the new format, stayed on as production chief and played a major role in the station's success. He had been at the station 18 years - one-third of his life - when he died suddenly of a heart attack on January 19, 1997. An era in radio died with him. Norm was a purist and a man of strong principles. Thanks largely to his efforts to keep R&B and pure rock & roll alive, interest in the blues is alive and well in Canada. His interviews with the stars of the '50s and '60s helped keep those artists in the public eye long after their hits left the charts. As noted below, he picked up where Alan Freed left off. There are those who have called Norman B. the Alan Freed of Canadian radio. If so, then, there are several eerie tie-ins. Norm's birthday was Dec. 18, three days AFTER that of Freed (who was born Dec. 15, 1922). Norm died on Jan. 19, three days BEFORE the 32nd anniversary of Freed's death on Jan. 22, 1965. It is also interesting to note that Freed started in radio in 1943, the year Norman B. was born. Freed did his last radio show at KNOB in Los Angeles in 1964, the year Norman started in radio at CJRT-FM in Toronto. Thanks, Norm and so long, for now.